Elliot Anderson's"Equivalents" exhibition is a follow-up to his "Averaged Landscapes" project, which was shown at San Francisco's de Young Museum in 2007. Anderson is an assistant professor of art and electronic media, and a faculty member of the Digital Arts and New Media (DANM) graduate program. Equivalents, a new body of work by assistant professor of art and electronic media Elliot Anderson, will be on display at Gallery 16 in San Francisco through March 27. The exhibition is a follow-up to Anderson's Averaged Landscapes project, which was shown at the city's de Young Museum in 2007. In this new work, Anderson said he questions notions presented by American photographer Alfred Stieglitz in his 1921 Equivalents series, where Stieglitz emphasized abstract fields of light and clouds to evoke equivalents of thoughts and emotions. 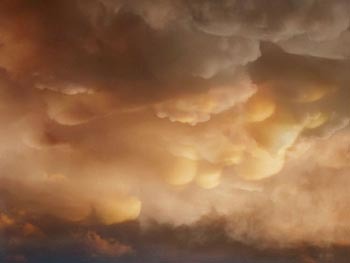 "Inspired by Stieglitz' work, I began collecting snapshots of clouds and skies gathered from web-searches on the Internet," explained Anderson. "Using software I designed, I averaged together a selection of these images." "Averaging is an algorithmic process that merges a series of images into one--creating a final image that is a composite of all those submitted to the software," he added. Anderson noted that another influence on this work is the aesthetic of the sky taken from Hudson River School paintings. The Hudson River School was a loosely affiliated group of 19th-century painters who lived and worked in the Hudson River Valley in upstate New York. "These artists were the first to truly represent the American Landscape," said Anderson. "The vocabulary of their work included luminous and at times ominous skies through which they sought to evoke an emotional response to an idealized American wilderness." Anderson received his B.A. in art from the Conceptual Design program at San Francisco State University, as well as an M.A. in interdisciplinary studies, focusing on technology art practice and 20th-century continental philosophy. He is a member of the faculty for UCSC's Digital Arts and New Media (DANM) graduate program. Gallery 16 is located at 501 Third Street at Bryant in San Francisco. For more information go to: www.gallery16.com.